So when I first joined the Warrior Forum last year, I saw a lot of posts about making money on Fiverr and I always used Fiverr to buy services that were awesome but never thought it was worth the time to be a Fiverr seller. Then I posted a few gigs just to test it out – gigs I knew would take me less than 5 minutes to complete. And in just 2 months, I’m now earning more than $25 a day on Fiverr. Posting A Message on Twitter or retweeting something on Twitter (I have 34000+ followers and will show you how to do that as well very quickly). Pinterest gigs – including repinning others’ pins. All of these gigs are quick and easy and in high demand – because my social networks have high value due to large amounts of organic, real followers who like what I share. These 3 gig ideas provide at least $25/day in sales on Fiverr (although I created several variations on each gig and gig extras as well to boost revenue). Then go buy TweetAdder and set it to follow 800 people a day in your niche. And schedule it to post at least 10 tweets a day every hour or so. You will very rapidly grow followers organically this way. Just make sure to respond to mentions when people talk to you – easiest way to get traffic and attention on Twitter. I get over 100 clicks a day on Twitter now doing this and it takes less than 10 minutes a day. For this you’re going to use Facebook Ads. You can get clicks for 1 penny or less if you’re very niche and also if you target cheap international traffic. Getting 5000 fans should cost $100 or less. For this you’re going to need raw Pinning power. Just pin a TON of photos. At least 100 photos minimum just as a start. Pin a variety of photos. The biggest mistake marketers make is pinning ONLY photos from their own website and only linking to their own website. This makes you look like a big fat spammer and no one wants to follow spammers. Share a variety of things, and repin others photos, like others pins, and leave comments. Pretty basic for social media. But just doing it will set you apart. Pinterest is still so new and exploding in growth so you will get Fiverr orders pretty much no matter what if you have a real account with some real pins and followers. Other great Fiverr gigs for marketers are guest blog posts. People love to get backlinks from high quality blogs so if you have a blog, offer to post their guest article for $5! It’s a win-win because you get paid to get free content, and they get a very cheap quality blog backlink. Cha-ching! Armand Morin is undoubtedly one of the top internet marketers in the world. He’s been around since the ice age of internet marketing. He’s practically an online marketing dinosaur! Except he still earns millions of dollars a year online and now uses some of the newest, most effective and efficient marketing ideas and strategies out there when it comes to making money online. Have you created your own digital products? Are you a small business owner who wants to make more sales online? Are you just looking to earn a little extra cash working from home? If you said yes to any of the above questions, then you owe it to yourself to watch this amazing video training from Armand Morin where he will show you exactly how to earn a six-figure income online by using some very simple, very powerful marketing strategies. Armand used to charge hundreds of dollars just to have people watch this presentation, but now for a limited time you can watch the entire presentation 100% free – no strings attached. I watched it myself and took over 4 pages of notes! Just one of the ideas he shared will literally double my online business this year. Most newbie online marketers make the mistake of trying to figure out everything on their own. They’ll spend weeks, months, and even years crawling forums with other newbie internet marketers who pretend they know what they’re talking about. They’ll try all these tricks to get instant traffic with the click of a button. They’ll even use BlackHat SEO techniques (not even knowing what they are or how it can get you banned by Google) just because they read about it somewhere. Success leaves clues! All successful people have a method to their success. Sure, some people just got lucky. But in the world of internet marketing where everything changes very quickly, luck is much less a factor. Furthermore, when someone like Armand Morin who has been around for over a decade earning millions of dollars a year online, do you think that’s just luck? That’s pure skill. That’s pure talent. That’s pure commitment and raw knowledge of how to earn money online. So if you want to learn how to earn money online from the best, you owe it to yourself to check out Armand Morin’s new training videos… which of course are still free! Once you watch the videos, post your comments below and let me know what you think. How to use Twitter to drive traffic? I used to think Twitter was just a big fad. Some big cosmic joke. Like there were a bunch of rich, successful internet marketers sitting around telling jokes about idiots who tried to used Twitter to drive traffic… because THERE IS NO TRAFFIC ON TWITTER! I mean I tried for over TWO YEARS to drive traffic on Twitter to my website. In that time period, I got less than 100 clicks! All that wasted time I spent trying to tweet and drive traffic. Then…I made a promise to myself that I would MASTER Twitter – no matter what! So I broke down and spent $55 on TweetAdder. In just a few days, my traffic exploded! I was getting 30-100 hits a day from Twitter within the first THREE DAYS of using Tweet Adder! So, without any further ado, here is my ultimate (FREE) guide to driving traffic on Twitter, using TweetAdder and some other REALLY COOL strategies. Get ready for mad traffic! Go to www.twitter.com and create a profile. It is like 2012, ya know. Fill out your profile as fully as possible! Use the entire 160 characters Twitter gives you to talk about yourself. Add Hashtags in your profile to get more followers – #TFB #TeamFollowBack and #FF seem to work best. Try also #F4F and #FollowBack if you have extra room! I put Tweet Search on Automatic for people who tweet keywords in my niche (for my nutrition blog I used keywords like nutrition, diet, exercise, weight loss, etc.) And I made sure that I only searched for users who speak English. I also put Follow on Automation with 800 followers a day. I put unfollow on automation with 600 followers a day. Since I get over 300 followers a day, that matches up alright. (By the way, go ahead and follow me @JuiceTom if you like and you can see my Tweeting and traffic generation in action). I also set tweeting to automatic with no more than 20 posts a day at least 40 minutes apart from each other. I write the tweets ahead of time and add in new tweets to the mix every few days. Write 20-30 good tweets to start and have it automatically post them randomly. It’s ok if you copy the same tweets every couple of days – no one will mind! And it will drive you more traffic. Make sure you don’t just spam THE SAME EXACT LINK OVER AND OVER. Sure, you want to drive lots of traffic to your squeeze page or sales page. Also drive traffic to each of your individual blog posts though for much better results. There are lots of other options on Tweetadder, but these are the most important. Buy those two gigs and you will be rocking it! Sure, most of the followers are fake. But it will A) give you credibility and B) allow you to use TweetAdder to its fullest potential and not max out at only being able to follow 2000 people at a time. When you have 20,000+ followers, you can follow up to 20,000 people or more! So there’s no limits to how fast you can grow with TweetAdder (Except for the internal daily following limits imposed by Twitter which seem to be somewhere between 500 and 1000 a day for smaller accounts). I promise you, the Twitter mentions and interactions will grow tremendously when you apply these simple steps and processes to grow your Twitter account and increase your traffic. You will get mentions daily so make sure you login and respond to people!! This will dramatically increase your traffic and trust in your network. Otherwise, you’re just a spamming robot account and no one wants that. So respond to the conversations and use the automations tools of TweetAdder and you’ll be good to go. Directory submission is useful for getting one way back links to your website. Gone are the days when submission to the article directories was a tedious manual procedure. Now with the help of PHP DIR SUBMIT, a php script that you can use ubmit to the websites directories, articles directories and bookmarks sites at once, no need to submit same information again and again. Not only that, you use it to start your own submission services business and make money online. PHP DIR SUBMIT comes with already loaded directories list, there are 300 article directories, 300 website directories and 300 social book marking sites in the list and you have flexibility to add more to that list. You can submit your article to all the directories at once, no need of repeating same exercise for each directory. If you own a website, you don’t have to pay to anybody for promotion. With the help of PHP DIR SUBMIT, you can instantly do it yourself. In addition to this you can submit your website to more than 300 well known social bookmarking websites. PHP DIR SUBMIT helps you improve your website’s ranking by the search engines like Google, MSN and Yahoo instantly. 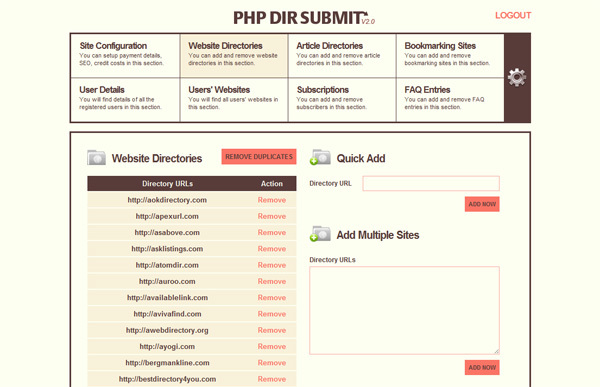 There are many directory submitter software in the market but PHP DIR SUBMIT is different from others. It allows you to manage 3 types of submissions, articles directories, website directories and bookmarking sites in one place. It comes with easy to use administration panel. You don’t have to pay upfront money and there is no monthly fee. You can buy credit as per your requirement. At the time of sign up PHP DIR SUBMIT gives you one credit free, which is sufficient to submit one website to all the directories. So whether you are a marketer or website owner, PHP DIR SUBMIT will help you get more traffic and make more money online.